Rajasthan was the land of rajas and maharajas where royalty ensured the development of a variety of beautiful arts and crafts... and of an array of mouth-watering food traditions. The cuisine of this state resonates with vitality and good cheer, despite the fact that its people have to struggle hard to draw up even the simplest menu from one of the harshest terrains of India. There is much more to Rajasthani cuisine than its signature dish, the ubiquitous Dal- Baati-Churma, Vegetarian Rajasthani food has a dazzling range of subtle and satisfying dishes like Gavarfali ki Subji, Ker Sangri, Panchmel ki Subji and so on. The accent in their vegetarian cuisine is on purity of ingredients and on richness. To their credit, this community has balanced this penchant for rich foods with the appropriate use of digestives, especially asafoetida, black salt, ginger and ajwain. They have an astounding variety of tongue tickling snacks. Rajasthani cooking in general has its own special flavour where the simplest and most basic ingredients go into the making of exotic recipes. The harsh climate, scarce rainfall and the non-availability of ingredients (especially greens) have a profound influence on the cuisine. Due to this scarcity, whatever vegetables are grown are often sun-dried so that they can be used for the rest of the year. Gram flour is extensively used to cook up delicacies also sun-dried mangodis and papad are used to whip up interesting and bajra and corn are used all over the state to prepare dishes like Bajra Khichdi. Moreover, Rajasthani food has plenty of delectable mithais to satisfy your sweet cravings. All the recipes in this book have been adapted to suit a variety of palates. Ghee and oil quantities have been limited while retaining the traditional taste and mystic of the flavourful Rajasthani cuisine. 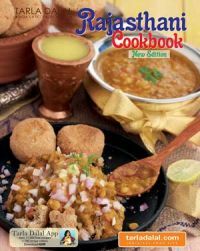 I am sure you will be able to whip up a scrumptious Rajasthani fare with these easy to follow recipes to surprise your family and friends.